If you are interested in meeting pets for adoption, please visit our Adoption Center at 128 Big Hill Avenue, Suite C, in Richmond, KY. We are open Saturdays from 12:00-5:00 PM or by appointment. NOW OPEN!! We are happy to be operating our very own Lost Cost Spay/Neuter Clinic in Richmond, KY on Big Hill Avenue. We feel these services are desperately needed to help our community with a truly affordable means to spay and neuter their pets. View Prices and More Info. Our spay/neuter clinic is open to both County and out of County residents. Request an Appointment Online - This is an appointment request only. If your request is approved, you will receive an email confirming your appointment. To schedule, there is a $20 nonrefundable deposit required for cats and a $25 nonrefundable deposit required for dogs. This deposit goes toward the total cost of your pet's surgery and the remainder will need to be paid on the day of your pet's surgery. If you get an error message, it is likely because all of our appointments are already taken. We book up REALLY fast, especially on female cats and dogs. The demand for appointments far exceeds our current ability to fullfil them all as quickly as everyone requests, but please try back, or try other low cost spay and neuter clinics. Since opening in 2012, we have spayed and neutered over 8,500 cats and dogs, and counting, here at the Humane Society A.L.L. 's Low Cost Clinic. Due to a lack of funding, this program has been discontinued effective 12/31/18. We also provide discount voucher certificates to qualified Madison County residents for spaying and neutering their pets at their personal Madison County veterinary hospital. It is our hope that this program will reduce the number of unwanted pets dying on our roads every day and lessen the number of homeless cats and dogs euthanized in shelters. Each year we help spay and neuter hundreds of dogs and cats with this funding. Click here for our Spay and Neuter Discount Application. We help Madison County individuals and businesses manage their feral cat populations through spaying and neutering. If you have feral cats and would like to get them fixed to stop their reproduction of homeless kittens, please call us and leave a message at 859.626.5600. At this time there is an extensive waiting list, so your support is needed so we can expand this program. 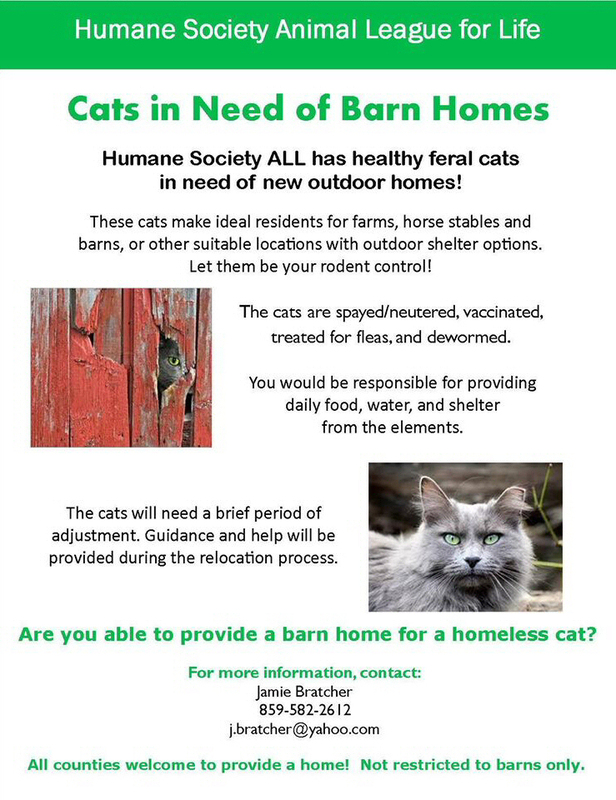 We also always need Barn Homes for feral cats. Animal abuse by children is often a precursor to violence as an adult. We provide educational classes to elementary schools and other interest groups. Presentations are age-appropriate and cover animal care and other related issues. Email us if you are interested in having someone from our group speak at your school or civic meeting. The potential threat of a disaster in our county poses a real concern to all animal lovers. The Humane Society is examining ways where we can coordinate and cooperate with other county organizations in providing aid in the event of a major catastrophe. We have, through our network contacts, the ability to offer advice, information, and a referral service to any interested person having an animal-related issue. A memorial gift can be given to the Society in remembrance of a loved one or a tribute gift can be given in honor of a special occasion or holiday. Your gift is not only a thoughtful tribute, but also helps the animals of Madison County. 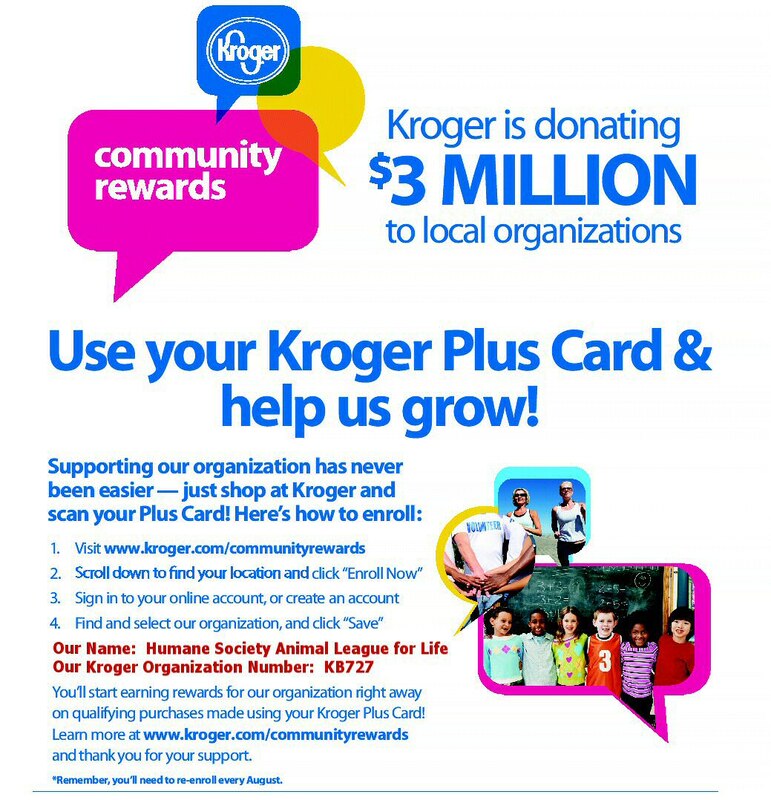 An Easy Way to Support the Humane Society, A.L.L. 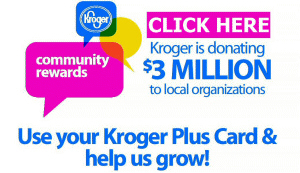 is by Shopping Through iGive.com!